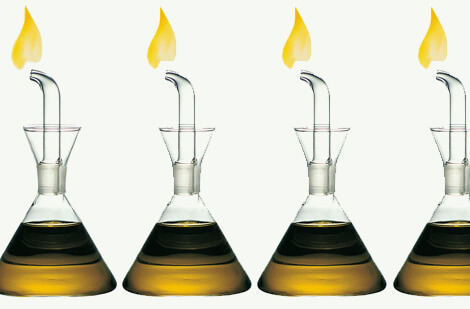 At the humongous Milan Furniture Show, Mobles 114 — a Spanish manufacturer — reintroduced the iconic, original design of the Rafael Marquina 1961 oil and vinegar cruet. I can’t see yet where this is for sale. I’ll keep an eye out and provide that update. I LOVE the fact that authentic, original designs are coming back so strong. It was the 50th anniversary of the Milan Show — so retro nostalgia was Big BIg BIG, according to the New York Times. Oh my goodness. You know, Pam, I actually do love the house I’m in, it’s the first time in my life I’m not looking at other houses with longing but reading the N.Y. article I do wish I had more space. Plaintive sigh. I’m a decor ‘ahem’ and some awfully exciting things are happening these days that bespeak art as much as home furnishings. The 42.50 Pound Alessi light bulb is a bit steep, ya think? But such interesting stuff in the retro area. Great article. Thanks for pointing the way yet again! There’s actually flame coming out of that? How is it fueled? ?